Wherever oils or other liquid chemicals are stored, transported or processed, there is the risk of contamination and leaks – this implies a hazard to the safety of people and the environment. To prevent damage professionally and to remove spills or leaks of hazardous liquids in a safe and quick way​. We offer nonwoven oil absorbent products ​and chemical sorbents. ​Spillosens sorbents rapidly and effectively remove liquid spills and leaks. As a precautionary measure, they help control the general hazards posed by spilled liquids in a simple and efficient way. They absorb a wide variety of operating fluids as well as a large number of acids and bases. Their absorbency amounts to approx. ten times to twelve times their weight. 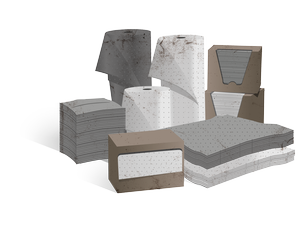 The different product types such as pads, absorbent pillows and socks or loose flakes permit their use as versatile instruments.